Cardiac cells contain numerous mitochondria, which enable continuous aerobic respiration and production of adenosine triphosphate (ATP) for cardiac function. The myocardium requires significant energy to contract continually over the human lifetime. These energy needs are met through mitochondria, myoglobins, and rich blood supply from the coronary arteries. The mitochondria generate ATP for the contraction of cardiomyocytes. Myoglobins are oxygen-storing and oxygen-transferring pigments in cardiomyocytes. Aerobic metabolism occurs when oxygen is present, while anaerobic respiration occurs when tissue is deprived of oxygen. Aerobic metabolism accounts for nearly all of the metabolic function in the heart, but anerobic metabolism may contribute as well. Glucose reservoirs and lactate recycling allow the heart to function even during malnutrition. lactate: A molecule produced by anaerobic respiration that can be used to produce ATP without oxygen, albeit at lower levels. myoglobin: A small globular protein containing a heme group that carries oxygen to muscles from the blood and stores reserve oxygen. The heart muscle pumps continuously throughout life and is adapted to be highly resistant to fatigue. Cardiomyocytes contain large numbers of mitochondria, the powerhouse of the cell, enabling continuous aerobic respiration and ATP production required for mechanical muscle contraction. Cardiac muscle tissue has among the highest energy requirements in the human body (along with the brain) and has a high level of mitochondria and a constant, rich, blood supply to support its metabolic activity. Aerobic metabolism is a necessary component to support the metabolic function of the heart. Oxygen is necessary, and if even a small part of the heart is oxygen-deprived for too long, a myocardial infarction (heart attack) will occur. Coronary circulation branches from the aorta soon after it leaves the heart, and supplies the heart with the nutrients and oxygen needed to sustain aerobic metabolism. Cardiac muscle cells contain larger amounts of mitochondria than other cells in the body, enabling higher ATP production. The heart derives energy from aerobic metabolism via many different types of nutrients. Sixty percent of the energy to power the heart is derived from fat (free fatty acids and triglycerides), 35% from carbohydrates, and 5% from amino acids and ketone bodies from proteins. These proportions vary widely with available dietary nutrients. Malnutrition will not result in the death of heart tissue in the way that oxygen deficiency will, because the body has glucose reserves that sustain the vital organs of the body and the ability to recycle and use lactate aerobically. Myoglobin: The heme component of myoglobin, shown in orange, binds oxygen. Myoglobin provides a back-up store of oxygen to muscle cells. Heart muscle also contains large amounts of a pigment called myoglobin. 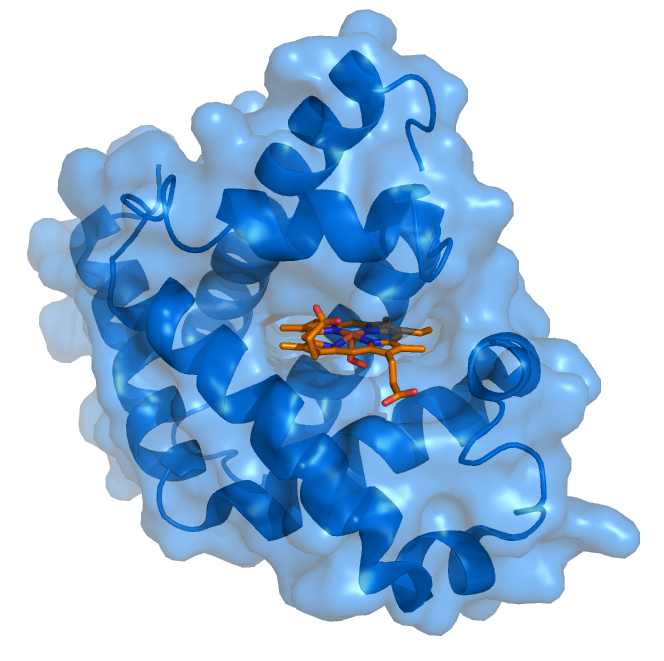 Myoglobin is similar to hemoglobin in that it contains a heme group (an oxygen binding site). Myoglobin transfers oxygen from the blood to the muscle cell and stores reserve oxygen for aerobic metabolic function in the muscle cell. While aerobic respiration supports normal heart activity, anaerobic respiration may provide additional energy during brief periods of oxygen deprivation. Lactate, created from lactic acid fermentation, accounts for the anaerobic component of cardiac metabolism. At normal metabolic rates, about 1% of energy is derived from lactate, and about 10% under moderately hypoxic (low oxygen) conditions. Under more severe hypoxic conditions, not enough energy can be liberated by lactate production to sustain ventricular contraction, and heart failure will occur. Lactate can be recycled by the heart and provides additional support during nutrient deprivation. Recycling lactate is very energy-efficient in the nutrient-deprived myocardium, since one NAD+ is reduced to NADH and H+ (equal to 2.5 or 3 ATP) when lactate is oxidized to pyruvate. The produced pyruvate can then be burned aerobically in the citric acid cycle (also known as the tricarboxylic acid cycle or Krebs cycle), liberating a significant amount of energy.